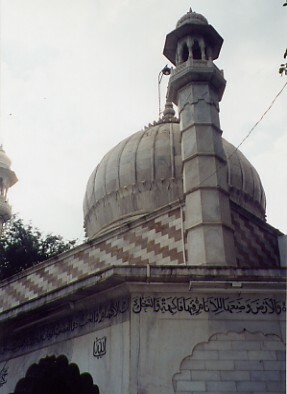 Marble dome of Qamar Ali Darvesh Dargarh in Shivapur. When I scribbled most of this down in a stuffy hotel room in Mumbai in January 2001, I had no premonition of the horror that was to unfold on September 11th.. At the time I was more preoccupied by the fact that I couldn't rationalise what I'd seen, rather than thinking very much about the symbolic purpose which lay behind it. What follows is still my original version-although I think about it differently today. The tale is now a metaphor. The stone is still there. It still levitates. And I still can't explain how. But perhaps, that's incidental. The reason why it does so is what this story is about. I am in India searching for a sarcophagus and a stone. Both objects lie at the heart of a tale about a Moslem Sufi saint who lived six centuries ago in the village of Shivapur, about 180 kilometres east of Mumbai. The story goes that Qamar Ali was born into a family of middle-class Moslems whose men-folk prided themselves on their muscular prowess. Qamar Ali, unlike his aggressive older brothers, was introspective and gentle. When he was scarcely six, he became a disciple of a Sufi Pir (great teacher) who lived nearby, and spent his days in meditation and fasting. Before long, throngs of devotees began to flock to his doorstep drawn by the young Sufi mystic's compassion and miraculous powers of healing. Qamar Ali died in his late teens but as he lay on his deathbed, he requested that a circular stone weighing 200 pounds, be placed near his tomb. 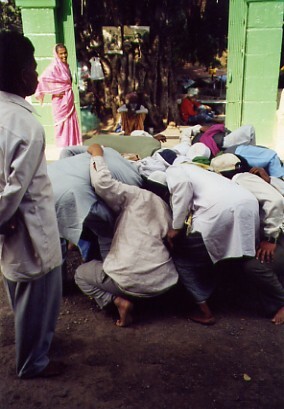 According to the legend, he said: "If eleven men place their right index fingers under the stone and then jointly call my name, I will cause it to rise higher than their heads. Otherwise, neither singly nor together will they be able to move it more than two feet off the ground. Let it be a symbol," he said to his brothers, "a reminder of my message that spiritual power is greater than brute strength. As Allah the Merciful, has loved you, so should you love all men of every caste and creed. For we are all brothers on the same journey. Think of this when you call my name and raise the stone." Today I am en route by car along the Pune-Satara road to Qamar Ali's tomb and the stone which, as decreed by the saint, supposedly levitates at the sound of "Qamar Ali Darvesh".The road winds and climbs through dun-coloured hills. Shivapur, a dusty little village, dozes in the late morning sun. Cows amble along the rutted road, women wash clothes at a communal tap and chickens flutter squawking at our approach. The shrine topped by a white marble dome comes into view, and we pull over. This is what has gnawed at me for months while in Canada, halfway across the globe. Now that I'm actually here I'm filled with misgivings. India abounds in tales of the paranormal: pre-cognition, telepathy, telekinesis and sorcery, much of which is of dubious value. Although historical records indicate that he and his family lived in the vicinity of Shivapur, Qamar Ali Darvesh is a shadowy figure. All that has sustained the legend over the centuries is this sarcophagus-and its mysterious stone. yes, there it is-a solid, grey, circular granite stone lying in the sun-drenched courtyard. 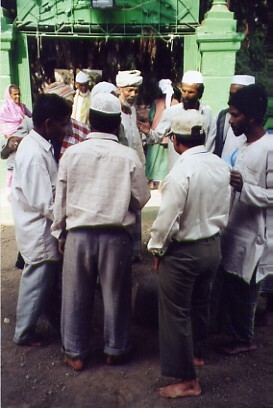 The resident mullah (priest), an elderly man wearing a white skull cap, invites Thite and myself into his small office. He is friendly enough, but blasé about visiting journalists. "Some TV crews have been here," he says in Hindi. 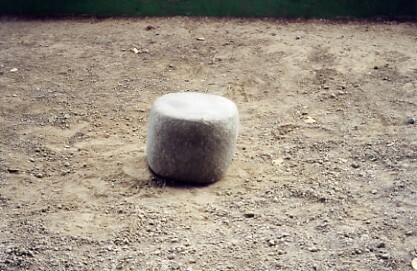 "A team of Japanese scientists spent a week studying the stone, but they too were baffled." I present the mullah with alternatives. 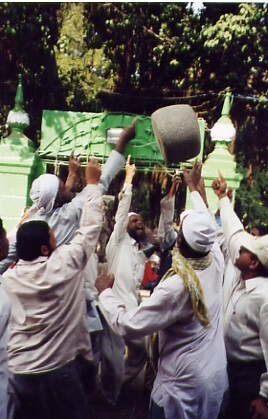 What if non-Moslems try to lift the stone? What if there are more than eleven men? What if the entire hand is used, rather than just the tip of a finger? What if they yell something else, or even something similar such as 'Tamar Wali Arvesh'? He shrugs and spreads his hands. "I can tell you none of that will work. But go ahead. See for yourself." He pauses, then adds. "Qamar Ali preached tolerance of all faiths, so participants do not have to be Moslem-Christians, Hindus, Jains, Buddhists, atheists, agnostics-everyone is welcome. But," he adds, glancing at me apologetically, "not women!" As we sip tea, the mullah continues. "I understand your curiosity, madam," he says, "but please remember this is a sacred stone, and each time we call upon Qamar Ali Darvesh, it is to remind us that he was a saint of great spiritual power and benevolence." He nonetheless agrees to my request to videotape and photograph the proceedings, but suggests that I do so as unobtrusively as possible. soil where it has previously landed. The courtyard is hot in the noon-day sun, and shadows are minimal. I am allowed to approach the stone just as long as I don't touch it. 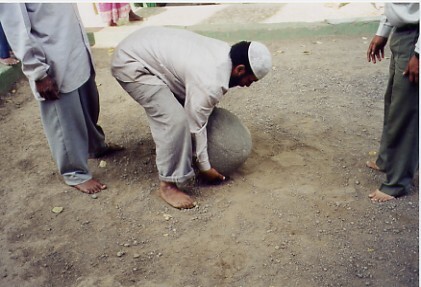 I photograph the stone while the mullah beckons a group of onlookers and three non-Moslem men off the street. They include a puzzled young man who is passing through the town on his scooter and had paused to buy something from a roadside stall, and a stick-like old man who looks incapable of lifting a cushion, let alone a rock. Including Thite there are now eleven men in all.. I ask one of the more muscular participants to first try lifting the stone single-handedly. He barely moves it an inch off the ground. "Viney," I whisper to Thite, "I would like to know whether the stone vibrates as you lift it, and how heavy it is when raised." .I ready my video camera as the men surround the rock. They stoop, place the index finger of their right hands under the rim of the rock, count to three, and then bawl, "Qamar Ali Darveeeesh!" The stone, like a living thing, flies up in the air, a foot above their heads. Caught off guard, I frantically move my video camera upwards to keep it in focus. The men scatter as it falls to the ground with an enormous thud. I take a deep breath. Thite turns to me, incredulous. "It didn't vibrate," he says, "but it was light! Light as Styrofoam!" On the second attempt, I capture it on film. Once again, the stone leaps skywards well beyond the men's fingertips, spins and, as they dodge out of the way, it crashes to earth. Then I try variations, changing one parameter at a time. I have to be tactful about this, so as not to appear disrespectful, but the mullah is right: none of them work. I pack away my camera, the mullah courteously bids us "Khuda hafiz" (May God be with you) and disappears into his office. So what, I ask myself, am I to make of this? No question about the fact of the phenomenon. With a quota of randomly selected participants, it doesn't appear to be rigged. Yet how does it happen? Western pragmatism tells me there has to be an explanation. Experiments with controlled levels of electromagnetic energy have been known to replicate poltergeist-like activity so I scope out the area for transmission or microwave towers. There aren't any. Could the courtyard itself be a powerfully charged electromagnetic field? Would Qamar Ali Darvesh have known this in the fifteenth century? I recall a party game: four of us could lift a fifth after a ritualistic laying on of hands. The explanation? The stiffened hands layered over the subject's head, lends strength to the tensor muscles and thus allows the participants to lift a heavy object with relative ease. Two hundred pounds distributed evenly among eleven men, would work out to about eighteen pounds each which, if the above theory is correct, might be feasible with a stiffened index finger. However, if this is so, then twelve participants should be able to lift the stone to a greater height. Not so. At my request, twelve men had surrounded the stone like a football huddle and raised it to mid-thigh level, after which it fell back with a dull thump. Eleven men with four fingers under the stone raised it almost waist high, but no further. Lamasery monks in Tibet have been known to levitate a massive rock at the entrance of a cave, in response to a particular volume, pitch and vibration of drums and horns. Does sonic resonance force the Shivapur rock to rise? If so, a series of similar words uttered at the same pitch and volume as "Qamar Ali Darvesh" should bring about an identical result. It doesn't. Viney Thite is equally perplexed. "Perhaps it was the gestalt effect of all eleven of us directing our thoughts towards Qamar Ali's words. Maybe we generated an extra surge of energy as we shouted his name in unison. Or maybe it's none of those things." He pauses thoughtfully to look out of the car window. The hills lie folded against the horizon, and small dust devils spin across the sepia fields. "India is an ancient land. It has its secrets," he says. "Perhaps we are not meant to uncover them all." .and six centuries after his death, still symbolically demonstrates it every time eleven men of varying faiths, gather around his stone and invoke his name. I went back to Shivapur in November 2007. I still don't have any answers as to why the stone levitates only provided certain parameters are met. The Shivapur shrine is not a tourist attraction and there are no organised trips to the Dargarh. There are no entrance charges, but visitors may add their contribution to a donation box if they so wish. The town is a four hour trip by car from Mumbai, via Pune. Alternatively, daily trains run between Mumbai and Pune and the most convenient way to get from Pune to Shivapur is by taxi. It is a half hour journey (about 30 km). The best time to visit is in the cooler months of November to February.